A great view of the canyons of the South, Middle and North Fork of the Sacramento River in the Trinity Divide. Tremendous views of surrounding mountains are one of the great joys of hiking on Mount Shasta. The far-reaching panoramas are abundant along every trail on the mountain. This is, in large measure, a result of the incredible amount of terrain that lies above the timberline. Most of the trails on the mountain travel across barren slopes where the trees are scarce. It is easy to appreciate the landscape when the forest does not obstruct the view. For those not setting out on the trails, great views are still within reach, especially when driving the final section of the Everitt Memorial Highway from just past Red Fir Flat to the road’s end at the Old Ski Bowl. Here drivers and picnickers are blessed with astounding views of Mount Shasta itself as well as the opportunity to take in much of the area to the south, including Lassen Peak. From the Old Ski Bowl, the views are even better and include most of the Trinity Divide and even the higher peaks of the distant Trinity Alps. These incredible spots are well known and easy to access. Yet there is another vantage point that offers stunning panoramic views stretching from the Lassen area in a wide arc to the northwest all the way to China Mountain at the nexus of the Trinity Divide and the Scott Mountains. This vantage point, the John Everitt Memorial Vista, was once a significant attraction on Mount Shasta. 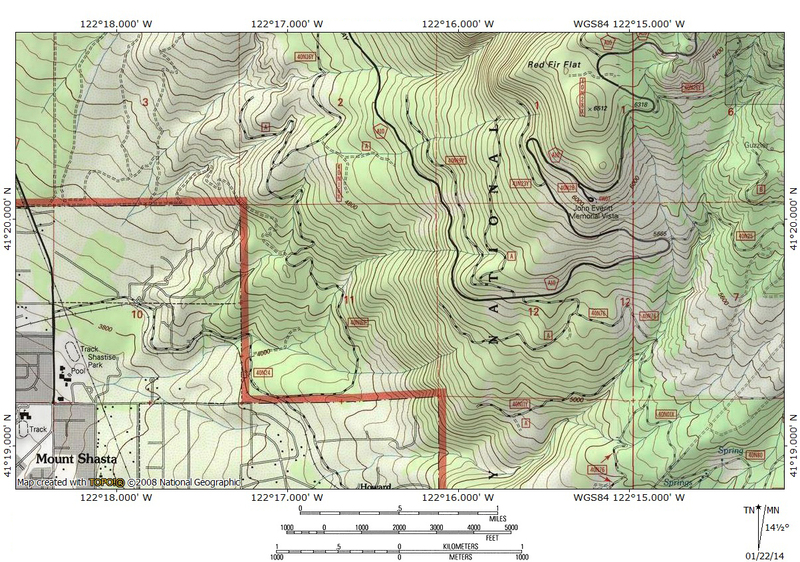 Now it is a nearly lost and forgotten relic, hidden amongst the dense forest of Mount Shasta’s southwestern flank. A view of the southern Trinity Divide, including the Castle Crags and the Grey Rocks, from near the Everitt Memorial Vista. The vista and the road that accesses it are named after John S. Everitt. He was the forest supervisor for the Shasta National Forest who died while fighting the Bear Springs Fire in 1935. At the time, the Shasta National Forest was a single entity, unlike now, when it is part of the Shasta-Trinity National Forest. After being founded in 1905 as the Shasta Forest Reserve, it was merged with the Trinity National Forest into its modern incarnation in 1954. The headquarters for the Shasta National Forest was located at the current ranger district offices in Mount Shasta City. It was here that John Everitt ran the administration of the lands on and around Mount Shasta. He was a part of the second generation of foresters that followed on the heels of forestry pioneers like Gifford Pinchot, the first head of the Nation Forest Service. Everitt was a graduate of the College of Forestry at Cornell, the first academic school of forestry in the U.S. He was undoubtedly influenced by the conservation ethic of men like Theodore Roosevelt and Pinchot, who were at the forefront of the forestry movement (amazingly, forestry was a new discipline in the early 20th century, as managing the forests of the U.S. became a concern in the face of increasing development across the country). Prior to his arrival in Mount Shasta, Everitt had worked for the Forest Service in the Lassen, Plumas and Stanislaus National Forests, as well as a stint in Southern California’s San Bernardino National Forest. He was appointed the head of the Shasta National Forest early in 1935. When the fire erupted on the southern slopes of Mount Shasta Everitt was quick to lead the effort to contain the fire. At the time, the Forest Service was still heavily influenced by the leadership of William Greeley who, as the head of the Forest Service, had made fire suppression the agency’s primary mission (in large measure a legacy of the Firestorm of 1910). Naturally, a fire on Mount Shasta was a significant concern to Everitt and the rest of the Forest Service. One afternoon during the firefight, Everitt set out alone to scout the fire. The winds shifted quickly and he was ultimately trapped and killed by the flames. He was the first forest supervisor killed in defense of his charge. The observation deck at the Everitt Memorial Vista. Today the Everitt Memorial Highway and the John Everitt Memorial Vista bear his name in tribute to his sacrifice on the slopes of Mount Shasta. The highway (OK, it is really just a paved road but compared to the rough dirt roads that climb the flanks of Mount Shasta, it really is a highway to the higher elevation) used extensively throughout the year. People refer to the Everitt Memorial Highway on a regular basis but few know the tale of the man for whom it is named. Sadly, the vista, located near the place where John Everitt lost his life, is all but forgotten. This is in large measure a result of the Forest Service’s decision at some point many years ago to not cut the trees around the observation deck. They have grown to the point that the view is all but gone. Only Lassen Peak far to the south is visible. 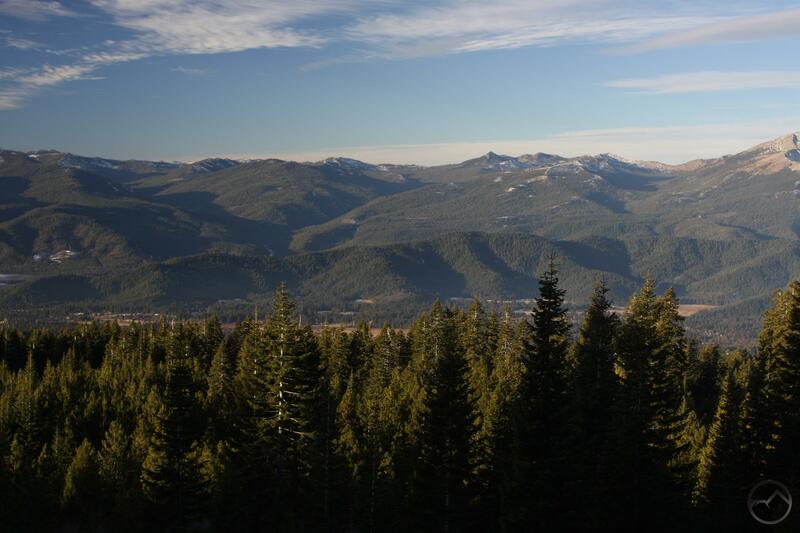 The Trinity Divide, the Trinity Alps and the Strawberry Valley (the large valley between the Cascades and the Klamath Mountains where Mount Shasta City is located) are all lost to the trees. That this site was not preserved is unfortunate. It is a great resource for the community and could provide a wonderful introduction to the region for those who are unfamiliar with it. Located below Bunny Flat, it has the bonus of being accessible all year since the road is plowed throughout winter. The infrastructure at the site is great. There is a paved road down to the circular parking area and a rest room. 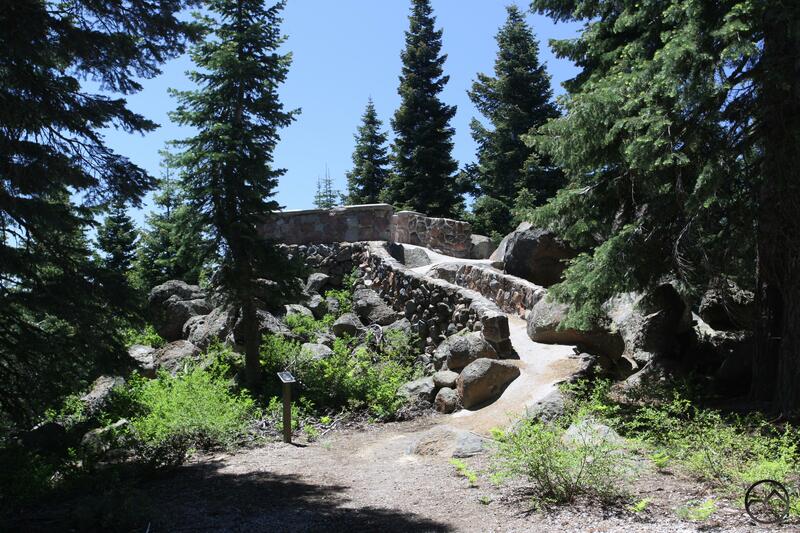 A short nature trail loops through the surrounding forest and leads to both the observation deck and the ruins of an old ski shelter that was once a part of a series of winter shelters that led to Mount Shasta’s higher elevation. The observation deck itself is an impressive structure, reminiscent of edifices one would expect to find in national parks. It is a shame that the view from this great spot has been lost. An awesome view of Mount Eddy and the northern Trinity Divide from near the Everitt Memorial Vista. In a recent conversation with a Forest Service member, it was revealed that plans are being made to harvest the trees around the vista and restore the view from the observation deck. There is no timetable for this action yet but this is the first step toward resurrecting this great attraction on the slopes of Mount Shasta and while there is a desire for restoration, efforts to do so hampered by lack of funds. Hopefully this area will one day be restored and folks can once again enjoy the picnic area and stroll to the awesome vista to appreciate the incredible mountains of the Mount Shasta region. Even now, with the view still obscured, the vista is worth visiting. It is a good place to enjoy Mount Shasta’s lower forests, its history and to ponder the sacrifice of those who have paid a price to preserve our heritage. To get there, drive 8.4 miles from the intersection of the Everitt Memorial Highway and Rockfellow (the beginning of the highway, near the high school). There is no sign but there is a paved driveway and a guard rail marking the spot. There is a fantastic view of the Trinity Divide and Strawberry Valley from the junction of the highway and the vista’s driveway. It gives a sense of the incredible view this site once provided and hopefully will in the future. It seems ludicrous to “harvest” timber to restore a view that only existed in the first place due to the clear-cutting of the original forest. The perspective that the panoramic view is being “lost” to the forest is erroneous. The original view, the one of the forest, is in the process of being restored. Would it not be better to let the majestic forests of Mt Shasta come back and enjoy the views where they are found? First off, I hope that it is obvious from the scope of this site that I encourage people to venture out and discover views wherever they can find them. Furthermore, I think it is readily apparent that I am in favor of preserving the wilderness throughout the area. That said, I think it is anti-human to advocate against limited modification of a small area in order to restore a great vista. The restoration’s footprint would be small. Moreover, I think it is callous to oppose the improving the vista’s view. After John Everitt died, building the vista was chosen as the fitting means of memorializing his sacrifice fighting the fire. When the observation deck was built, the area had just been burned over, opening the forest canopy and permitting the great view. The forest has since restored itself after the fire but I do not think limited modification to maintain the memorial is inappropriate. If anything, it is in the spirit of Everitt’s forestry ethic. Lastly, this is not an issue that is limited to Mount Shasta. Many famous views in places like Yosemite are suffering from the encroaching trees. We absolutely want healthy forests but selective cuts to maintain these incredible views is beneficial. If nothing else, those folks who are physically unable to venture into difficult terrain are able to perceive the land’s tremendous beauty and be influenced to use their resource and vote to protect the landscape. Surely we are not opposed to that? Personally, I believe these these kind of vistas are incredibly important, maybe for no other reason than Bubba pointed out; the enjoyment of people who otherwise wouldn’t be physically capable of reaching these breathtaking vistas. I also believe it can serve as a spark in children, or anyone for that matter with a sense of curiosity. A curiosity for unknown wilds and a sense of adventure. These vistas also serve as a classroom. Many times have I looked from similiar vistas and studied the drainages and wondered where particular bodies of water may lie. It’s from this kind spark which has led me to explore our vast wilderness areas here in N. California. From my explorations I’ve come to understand and appreciate the rhythms and wonders of nature a little more. This appreciation has created in me a desire to keep these special places safe, and to protect them, so my children can experience them later in their lives if they choose to do so. I can’t say that I have personally made great strides in the preservation of our wild lands, but I can say that I have picked up my share of trash in the woods. I also bury my business deep and pack out my tp. So from my experience, protected and reachable vistas, such as the Everitt Memorial Vista, breeds curiosity. Curiosity fuels exploration. Exploration nurtures understanding and appreciation. Born from this understanding and appreciation comes the realization of the necessity for preservation. I guess i am just callous. I am not anti human, but I do not believe this is an anthropocentric universe. There are a lot of views out there to be found, even for those who are unable or unwilling to leave the comfort of their automobiles. My opinion is that cutting trees to restore a view that was created by clearcutting and fires for people who cant or wont get out of their cars is very old paradigm.. I think this is an issue where we will have to agree to disagree. You have the right to your own opinion…which is also a very old paradigm. Wow. I am fine with the agreement to disagree. However declaring the the right to ones own opinion is an old paradigm is troubling, to say the least. Are you saying that in this Brave New World we should all have the same opinion on things? I was making the point that paradigms are not wrong or “ludicrous” simply by virtue of being old. You have the right to your opinion. I affirm that right. That is a right that is based on an old paradigm. I am always pleased to learn the history behind things in our modern world, and this was worth learning. I was raised in a U.S. Forest Service family and always hold a place in my heart for people who take care of forests (to the best of their ability despite Washington, D.C. always thinking they know what’s best for us), and for those who fight forest fires.